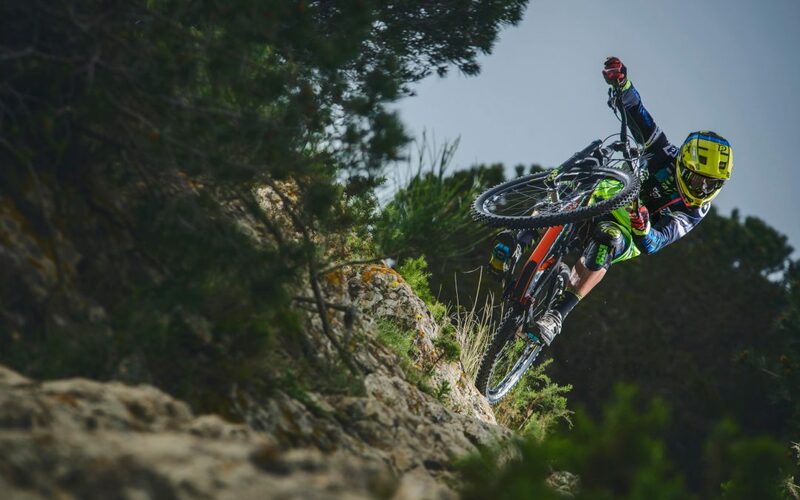 Taking time to adjust your mountain bike suspension will help you get the most out of it on rides. Read on to learn how to set up your suspension. Our advice applies to both front and rear shocks. The first step is to dial in the preload for your body weight so that you get the proper amount of sag when your suspension is loaded under normal riding conditions. There are two ways to make this adjustment, depending on whether your fork is air sprung or coil sprung. For air sprung shocks, which are a majority of current shocks, first consult your shock’s manual for guidelines about how much air pressure to put into your shock. Then use a shock pump to add or remove air as needed until it has the recommended amount of pressure. Consider this a good starting point; however, further adjustments may be required. For coil sprung shocks, also check the manufacturer’s recommendations for your rider weight, and then swap out coil springs as needed per this recommendation. For both types of shocks, test your setting by measuring your sag. Push the rubber wiper or O-ring down against the shock’s seal. Then softy climb onto your bike, being careful not to make it bounce. It’s easiest to have someone hold your bike for you, but if no helper is available, you can lean against an adjacent wall or table for support and balance during this process. Next, stand up on level pedals and weight your bars and pedals like you would if you were riding in this position. Now gently climb back off and check how much displacement there was of the rubber wiper(s). Recommendations of 15-30% of sag are typical but vary depending on how much travel your shock has and what type of riding you’ll be doing. It’s best to check the recommendations for your specific shock(s). If you set initial sag to be more than recommended, you’ll run out of travel relatively sooner and perhaps “bottom out” your shock prematurely. If you set initial sag to be less, you may not be taking full advantage of the travel your shock does have. It’s common for cross country riders to set up their bikes with less sag (percentage-wise of total travel) than downhillers since cross country riders tend to want to maximize pedalling efficiency and downhillers tend to want to maximize their bike’s ability to soak up bigger hits. Compression damping is about how fast your shock compresses when loaded. This is often controlled by adjusting the size of the hole through which your shock’s fluid can pass during the shock’s compression. Many shocks have a knob for adjusting compression. Rebound damping affects how fast your shock extends back toward full length as it’s unloaded. Just like with compression, many shocks have a knob for adjusting rebound. Compression and rebound knobs often have + and – symbols on them. The + symbol indicates that there will be more damping (slower action of the shock to compress or rebound) while the – symbol means there will be less damping for (faster action of the shock). The best way to test compression and rebound settings is to ride you mountain bike repeatedly over a fixed section of trail while trying out different settings with each pass to see which feel the best to you in conditions most like what you typically ride. Exact compression and rebound settings are a matter of personal preference. In general, if you set damping too high, your shock(s) will feel sluggish and not responsive enough. Likewise, the opposite is true; if you set damping too low, your shock will feel too springy. When you initially set up your sag, do so while wearing a pack of equivalent weight to what you normally do so that your setup reflects real riding conditions. If you gain or lose significant weight, recheck your shock’s settings. Because temperature and pressure are directly related, your experience of riding your shock will vary with temperature. You may need to re-adjust your settings if you take your bike out to ride in significantly colder or hotter conditions. Over time, forks tend to lose air pressure, and damping knobs get bumped. Once you’ve found your ideal settings, write them down, then periodically check them for consistency. You may periodically need to add more air or tweak a knob slightly.